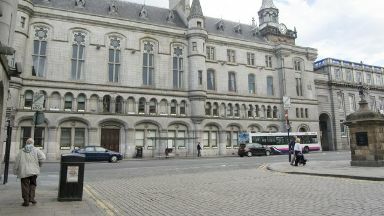 Jed Duncan, from Peterhead, is alleged to have fled from Aberdeen Sheriff Court. A man allegedly escaped from custody outside a court building in Aberdeen before fleeing in a car then crashing it. Jed Duncan is alleged to have fled from Aberdeen Sheriff Court at 11.40am last Wednesday. The 23-year-old was apprehended at the weekend and appeared at the same court on Monday. He faces charges of attempting to pervert the course of justice, dangerous driving, driving without a licence, driving without insurance, and failing to stop and report an accident. Duncan, of Peterhead, made no plea during a brief private hearing on petition. The case was continued for further examination and he was remanded in custody meantime.